Toast of Downtown -- And Giveaway! - San Diego Dining Dish! Toast of Downtown -- And Giveaway! I know that it's only November 1st, but the holidays will be here before we know it! Actually, I feel that Hallowe'en, Samhain, and Day of the Dead sort of roll in with the winter holidays anyway. It’s time to toast the holidays and reclaim all that is merry and bright – with plenty of festive cocktails, notable nibbles, and shopping discounts for all (21+)! 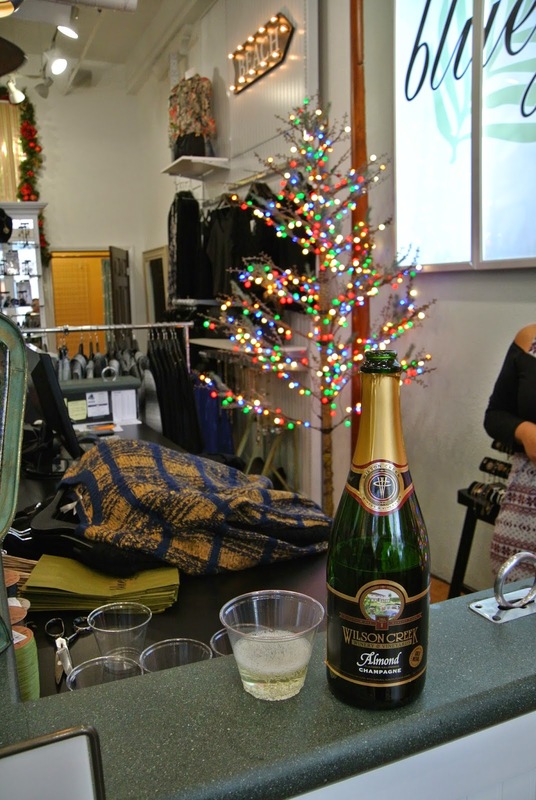 The Toast of Gaslamp, Saturday, December 9th is pleased to bring you another self-guided walking tour that will have you tasting, toasting, and shopping with 20 sips, 20 bites, and 20 shopping deals that will leave you rosy and ready to carol from 1pm to 5pm. Mingle with friends, family, and fellow San Diegan’s as you Toast your way through the historic Gaslamp Quarter. Toast of Gaslamp is the perfect way to spend an afternoon festively feasting as you stroll your way through two dozen of the most delicious Gaslamp Quarter restaurants! Don't forget to pick up gifts from over a dozen Gaslamp Quarter stores offering special discounts for Toasters. Don your festive attire, round up your friends, and enjoy an event that has become a holiday tradition for many San Diegans – Yule have a blast! Purchase your tickets early for only $25 in advance or $30 the day of the event. For more information, visit Gaslamp.org. Tickets can be purchased atnightout.com/events/toast-of-gaslamp/tickets. Now for the big news! I have 4 tickets to give away to this event, to 2 separate winners! So comment below on your favorite holiday tradition for a chance to win! Winners will be chosen on the Monday before Thanksgiving! The children in my family always dress up as a living nativity before gift time! It's so cute. Oh my gosh, where do I begin, My husband and I have so many holiday traditions. We see the Nutcracker at the Civic, attend the San Diego Symphony holiday concert, we go the Hotel Del and see their beautiful Victorian tree and watch ice skaters, we attend December Nights (Christmas on the Prado), We pick out our Christmas tree and decorate while watching Christmas themed movies, We drive around and see many Christmas light displays around the city and we donate toys to the charity programs around our city. We make tamales and enjoy them on Christmas Eve and after all the hustle and bustle of the holidays is over we enjoy a relaxing Christmas Day at home drinking hot chocolate and eating homemade cinnamon rolls in the morning,opening our gifts and together my husband and I create a Christmas dinner. (Usually a Prime Rib Roast). I make sure I take my wife to see the Nutcracker every year for the holidays. We roast chestnuts and always have eggnog as a holiday tradition. My wife makes Christmas fudge and rocky road candy every year and it's a tradition to take it with us along with hot chocolate and watch the San Diego boat parade down by the Star of India. We have a lot of holiday traditions in the Seller's household. My favorite tradition is the huge gourmet potluck we have as we gather our favorite people and food. It's such a smorgasbord of food but at least I get all of my favorites in one place! My favorite holiday tradition would be my families Christmas breakfast feast. Nothing starts off the day like stuffing your face with bacon then opening presents. Ooh what a fun giveaway, I love the Toast of Downtown! I think my favorite holiday tradition is cooking a huge meal for all of my friends and family. When I was a kid that's what my grandmother did and it feels great to take over her tradition. My family tradition is decorating the Christmas tree the day after Thanksgiving! Each ornament means something on the tree! We also make cookies and listen to Christmas music! ooh i bought tickets to toast of gaslamp last year and had so much fun with my friends! i am definitely interested in going this year too! i'd say one of our holiday traditions is getting together with the cousins (our age) and doing a [very boozy] variant of white elephant! and grandma's buttered chicken wings! My favorite tradition is a champagne brunch on Christmas day! My grandmother used to make her chicken noodle with cream soup every Chrismas Eve while we opened Christmas gifts. She passed over 20 years ago but we never go a Christmas with making her soup. Its comforting in more ways than one to have this tradition with my family. Thanks for this great giveaway! My favorite holiday tradition so far is driving around town looking for the best Christmas lights around San Diego. I love how families will sit out with homemade hot chocolate greeting every new spectator. Of course we can't forget to attend one of the Balboa nights with its festivities. Where else would we be able to take a tour of the world through tasty cuisine or pick our favorite bundle of mistletoe for the season? It truly is the most wonderful time of the year! My mother always cooks a goose- which is actually the most traditional thing you can do but no one does it any more! We have to special order it from the local butcher weeks ahead of time!! My favorite holiday tradition is the bbq duck we order from a family friend's shop. It was my dad's favorite growing up, and always reminds me of my childhood.